Leaving the Texas behind, we enter New Mexico, the land of extremes and contrasts. Capped by high mountains and land of extensive desert plateaus and broken mesas, New Mexico contains large habitat for animals, plants, and boasts rich history and diverse blend of cultures. From ancient Aztec through dozens of Native American pueblos and tribes to the great history of the True West, The Santa Fe Railroad and Billy the Kid. The considerably high mountain ranges and its passes in New Mexico became legendary and feared by motorists, who even today renounce to follow certain Route 66 sections in bad weather conditions. The road itself has less of the actual “old road” than any other of the states, which makes finding the old road and bypassed ghost towns a little bit more difficult, though the effort is usually well rewarded. The Blue Swallow Motel: Location – Tucumcari. Built in 1939, with a beautiful panels of 66. Along with other motels in the area, Blue Swallow Motel is protected and entered into the national register of historic buildings. The Tee Pee Curios: Location –Tucumcari. Teepee – shaped souvenir shop. A true icon which remembers the finest times of Route 66. The Blue Hole: Location – Santa Rosa. A geological phenomenon, a cavity 80 feet deep which holds a fresh and clear water lake of temperature of continuous 18 degrees Celsius. You are even allowed to scuba dive. The Basilica of Saint Francis: Location – Santa Fe. Located high in the mountains beyond 7,000 ft, in the the oldest city in the west, and on one of the oldest alignments of Route 66. Definitely worth seeing. The 66 Diner: Location – Albuquerque. Very beautiful, typical dinner from the 1940s. 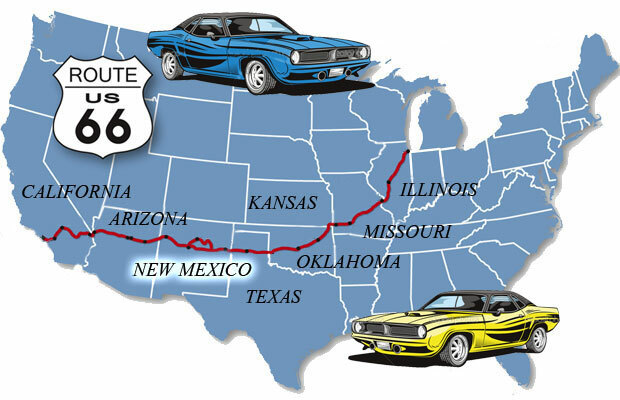 It is also the headquarters of the Route 66 Association in New Mexico. The Albuquerque also hosts yearly biggest hot air balloon festival in the world. Sandia Peak Aerial Tramway: Location – Albuquerque. The longest cable car in the world. It leads to the ski area of ? ?Sandia Peak from which you can also admire breathtaking views of the majestic Rio Grande. The Central Avenue: Location – Albuquerque. The longest avenue in the world. It spreads for 30 kilometres (18 miles) or 3,200 blocks. Route 66 follows it right through from east to west of the city. El Rancho Hotel & Motel: Location – Gallup. Famous lodging establishments in New Mexico which used to be visited by the biggest film stars in the times when New Mexico was eagerly considered the branch of Hollywood studios. Carlsbad Caverns National Park: Distance – 237 miles, 4h from Santa Rosa, NM. Beneath the bleak stretch of cactus, rock and sand of the Chihuahuan Desert and Guadalupe Mountains in south-east of New Mexico, there exists a world of exquisite beauty, a hidden wonder of many caves of which some are still being discovered every year. Attractions – Caving, Hiking, Rock Climbing, Bat Watching. Chaco Canyon National Historical Park: Distance -156 miles, 3 h from Albuquerque, NM. A stretch of Chaco Wash in the San Juan Basin which was central to thousands of ancestral Pueblo people between 850 and 1250 A.D. The massive pre-historic structures testify to the organizational and engineering capabilities not seen anywhere else in the south-west of America. Attractions – Camping, Hiking, Biking, Climbing, Fishing. White Sands National Monument: Distance – 227 miles, 3 h 30 min from from Albuquerque, NM. Great wave – like dunes of gypsum sand which spreads over 275 square miles of desert. White Sands National Monument is also a preservation area for many plants and animals that live there. Attractions – Hiking, Sand Sledding, Nature Watching, Dunes Driving. San Andres National Wildlife Refuge: Distance – 228 miles, 4 h 45 min from Albuquerque, NM. The National Wildlife Refuge is located in San Andres Mountains and preserves the largest intact Chihuahuan desert mountain range in the U.S. If you are a fan of “Grand Theft Auto” Games, you have already driven through some parts of this area many times. Attractions – Fishing, Camping, Hunting, Nature Watching, Hiking, Mountain Biking. Cumbres & Toltec Scenic Railroad : Distance – 106 miles, 2 h from Santa Fe, NM. You will encounter here some of the world’s best, most diverse sceneries of the numerous jagged volcanic summits, 13 of which rise to over 14000 feet, as well as many waterfalls, streams and lakes. The train departs either from Antonito, Chama, or New Mexico. Attractions – In the area you can engage in Hiking, Biking, Fishing, Boating etc. El Malpais National Monument: Distance – 26 miles, 35 min from Grant, NM. Stark and beautiful landscape of one of the best continuous geologic records of volcanism on our planet. Activities – Hiking, Nature Watching, Caving (exploring some of the caves requires a permit).